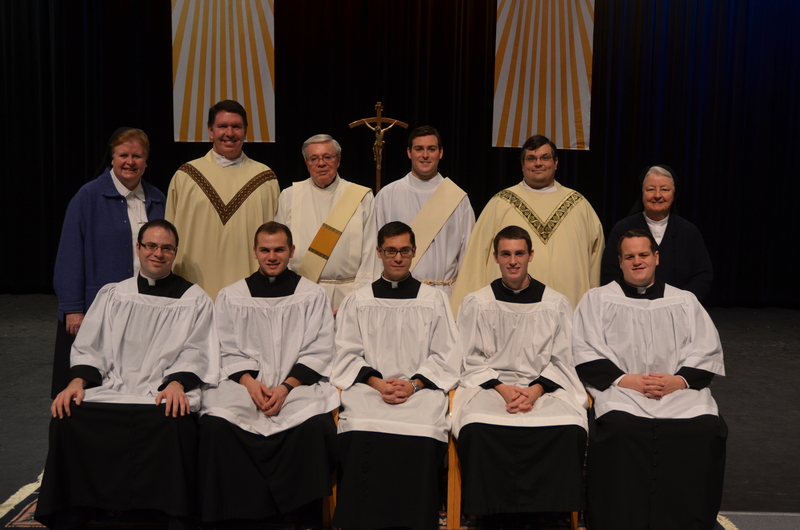 Deacon John Stokely (back row, third from right) recently returned to his alma mater, Bishop Shanahan High School in Downingtown, to preach at the school’s Thanksgiving Mass Nov. 21. It was Deacon Stokely’s first homily given at the school since his diaconate ordination last May. He was joined by fellow St. Charles Borromeo seminarians and Shanahan alumni (seated, from left) Brian Connolly, Matthew Robinson, Austin Chukinas, David O’Brien and Mark Cavara. Seminarian Allesandro Giardini, also a Shanahan alumnus, was not present at the liturgy. Joining the seminarians in the picture are (from left) Sister Maureen McDermott, I.H.M., principal; Father Matthew Guckin, campus minister; Deacon Gene Favinger, former faculty member; Father Kevin McCabe, faculty member; and Sister Regina Plunkett, I.H.M., president.